“We’re comin’ over to your place with some wine,” the friends I’d just left phoned as I pulled into my dark driveway. “But, uh … ” I sputtered. “We’re almost there. Bye.” There was just enough time to pull out five wine glasses. “Got any matches?” someone asked when the wine was poured. They gathered up their glasses and newspapers, found an old log, and made a campfire on the deck. The deck that once housed skunks; the deck that last year harbored a fox family and earlier this year was home to snakes. Squirrels and chipmunks scamper about daily on this deck, undaunted by the barking dog. The past week the dog, my son, and I watched woodchucks and raccoons dart underneath. This year I’d only lingered outside my house briefly a few times to listen to coyotes and frogs or to photograph 2014’s super-moons reflected in the pond. In the three years since my daughter died, and the three summers in and out of hospitals before that, I had stopped reading and watching stars on the deck. So wild creatures found it a peaceful spot. But on this night, between my son grilling his hamburgers, the prowling dog, and the friends stomping on the planks, raising flames and wildly whooping it up as they washed down the wine, on this first campfire of the year we took back the deck. After, I went to bed with my hair smelling of smoke and slept through the night. 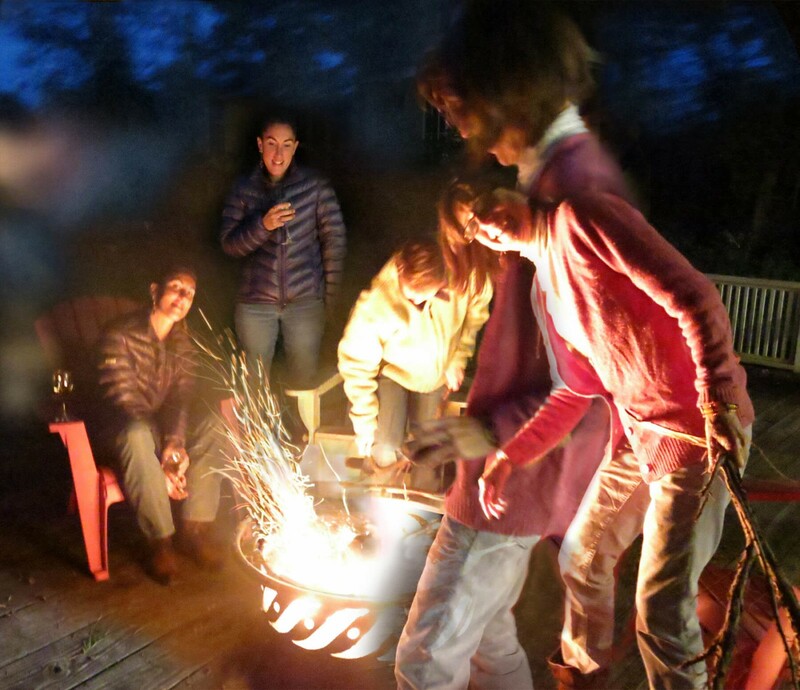 This entry was posted in 2014 and tagged backyard campfire, finding joy after loss, reclaiming life, recovering joy, super moons, under deck animals, whooping it up, wild creatures on 2014/09/15 by Robin Botie.